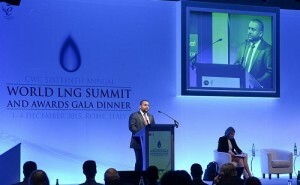 Despite some recent turbulence, the global business environment for liquefied natural gas (LNG) remains strong, and a continuous growth in demand is expected for years to come, said Khalid Sultan Al Kuwari, Chief Marketing and Shipping Officer of RasGas Company Limited at the CWC 16thWorld LNG Summit held recently Rome, Italy. Presenting his‘Overview of the LNG Industry in the Year Past, the Present and the Future’as a member of the Global Strategy Panel at the Summit, Al Kuwari said that a growth rate of approximately five per cent per year from 2015 to 2025 is anticipated, and during this period LNG demand is expected to outpace the overall growth in natural gas demand. He acknowledged that “As Asia’s LNG supply has increased and demand has eased, the traditional Asia premium has been challenged. This, combined with the recent drop in crude prices and the resurgence of nuclear and coal for power generation, has changed the familiar landscape for LNG in Asia, and brought into question economics for some new and some planned LNG projects”. However, new customers and new markets for LNG are also increasing at an ever faster pace. “LNG is still a business requiring significant capital investments in production, liquefaction, and transportation. As such, LNG requires reliable participants, like RasGas with a long term vision and the resilience to overcome short term uncertainty I am still very optimistic that RasGas and the gas industry as a whole will be able to proactively embrace change and to continue to evolve the business to meet the growing needs of our customers and to meet the objectives of our sponsors and shareholders,” said Al Kuwari. The annual CWC World LNG Summit brought together industry’s leading players to address the key issues facing the global energy sector.